February 2018 saw the third Yahapalana election take place. This was the long postponed local government elections, which for the first time were all held on the same day, making it feel like a general election. The elections were contested on a political party basis with UNP, SLFP, UPFA, JVP, and TNA fighting it out. This election saw the emergence of a new party, Sri Lanka Podujana Peramuna. This is not an election that Yahapalana wanted. Therefore, there were obstacles. Nominations were rejected for flimsy reasons. Nominations of the United Left Front for Nivitigala Pradeshiya Sabha was rejected because there were 15 names instead of 12. The returning officer refused to allow a correction. When the ULF representatives went away and came back with the revised list, they were detained at the gate till 12 noon. When they finally met the returning officer, he said that nominations closed at noon and had refused to accept the list! Over ten nominations lists were rejected. Supreme Court refused to touch the matter. The Local Government elections were held on February 10, 2018. The election was peaceful with no major incidents being reported said CaFFE Executive Director Keerthi Tennekoon. The election had a very high voter turnout, especially for a local government election. Television news showed long queues, grim looking voters and many feeble senior citizens, determinedly, going to vote, helped by others. The important result of this election was the emergence of the Sri Lanka Podujana Peramuna (SLPP) as the most popular party. This SLPP was a new, untested, political party, registered only in November 2016. Yet it succeeded in beating the three government parties, UNP, SLFP and UPFA as well as the reserve party, JVP. SLPP polled 44.69 per cent, 2 per cent less than the other three parties put together. This is the first time since 1948 that a government in power lost at LG polls, said Rohana Wasala. The large number of votes for Sri Lanka Podujana Peramuna (hereafter Pohottuwa or SLPP) was not a surprise for those who had watched the numerous rallies held after 2015 presidential election and the huge attendance at Pohottuwa election meetings. The popularity of this party was never in doubt. From the time Yahapalana came to power, there were huge pro-Rajapakse rallies and marches and the election campaign saw massive crowds at the Pohottuwa meetings. But it was an unpleasant surprise for the Yahapalana government. ‘We are not where we hoped to be by this time, said Mangala Samaraweea.” For about a week or ten days after the elections, the President and Prime Minister stayed out of the public eye. They were not seen on television news giving away prizes, opening buildings, speaking at functions as they used to do before. USA, though active also kept a low profile, until on the 24 of February, we were told that USS Mercy would visit. Some observers see a similarity between 1815 and 1818 and now 2015 and 2018. Before the elections, the JVP really believed that it could comfortably gain votes at the expense of the UNP and the SLFP. A confident JVP went to the extent of declaring intentions to achieve kingmaker status at the next Presidential and Parliamentary polls. Instead, the electorate has delivered a humiliating snub to the JVP, perhaps for its in backing the government at crucial junctures, especially in helping to get certain anti-democratic legislation passed with 2/3 majority in Parliament, observed Shamindra Ferdinando. CaFFE Executive Director Keerthi Tennekoon said What we have seen in this election is a very unique situation. The flower bud party very clearly won the election. No government in power has ever lost so badly. This clearly indicates that during the past two-and-a-half years this government has failed miserably. The people had given the government a clear sign to step down. He warned that if the government fails to respect the people’s verdict, there will definitely be a mass uprising against the government from next week. The people have given their verdict. Honest crooks are better than dishonest crooks. Naked ambition is preferred to ambition wrapped in false altruism. Better to have good war winning crooks than crooks who shield other crooks”, said a cynical observer. The triumphant Pohottuwa held a media conference after the election. Its leaders paid a glowing tribute to both print and electronic media for ensuring sufficient coverage for them in spite of difficulties. This was a historic victory. Never before had an Opposition political party defeated the governing party at a local government election. UNP had spent over Rs. 1 billion for propaganda and SLFP a little less than that, yet they couldn’t overcome growing public resentment. President Sirisena and Prime Minister Wickremesinghe couldn’t even win their Polonnaruwa and Colombo districts. Former President Chandrika Kumaratunga could not win Attanagalla either. A smiling Dinesh Gunawardena said that President Sirisena and PM Wickremesinghe had suffered an unprecedented heavy defeat at the first Yahapalana election in three years. “This is nothing but a shameful defeat for the President and the Prime Minister “, he said. 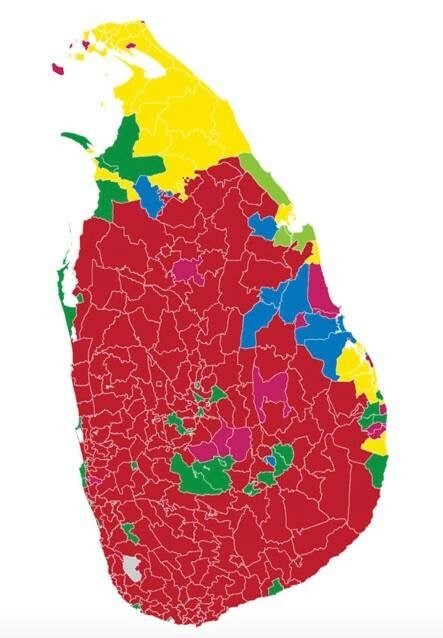 Never before had a new political party defeated both leading political parties in Sri Lanka’s political history. Not only the village, but most of the towns and cities have placed their trust and confidence with the SLPP. Yahapalana must now give up power. They have been rejected by the people. . Even the people of the Polonnaruwa district have placed their confidence with the SLPP as it had won with more than 5,000 vote majority, concluded Dinesh. The Yahapalana leaders, Sirisena and Wickremesinghe should realize what they badly lost was a referendum on the performance of three-year coalition, said G.L.Pieris. Wimal Weerawansa said the people had been so disappointed with Yahapalana mismanagement of the country, they overwhelmingly voted for SLPP proxy at Maharagama and Thirippane to inflict losses on Yahapalana partners. SLPP had backed independent groups contesting Maharagama Municipal Council and Thirippane Pradeshiya Sabha since their nominations had been rejected. Weerawansa said that there had never been an instance of a party in power losing local government polls like this. This victory was even bigger than the 1956 revolution. I agree. I was also thinking the same. I remember the 1956 election. The 1956 result was looked down on. It was seen as the push of a backward group of Sinhala speakers who should never have been given a say in politics. The Pohottuwa vote, on the other hand cannot be dismissed lightly. It was a carefully considered vote of a seasoned electorate who had been going to the polls for years and years. Pohottuwa is not a breakaway party of the SLFP. Chamal Rajapaksa made this clear on television. ‘This is a new party’, he said, ‘not a branch of the SLFP or UPFA’. Pohottuwa votes were also not votes of disenchanted UNP and SLFP voters. Such votes would have gone to the JVP who were eagerly awaiting them. Pohottuwa was not the refuge of the floating vote either. That too would have gone to the JVP. It is possible; however, that some of the floating vote has now come to roost in the Pohottuwa, provided the Pohottuwa delivers what is expected of it. Pohottuwa is a pure Mahinda Rajapaksa party, unconnected to the SLFP of the Bandaranaikes. In fact Pohottuwa has no links to anything except to the much reviled Mahinda Rajapaksa, probably to the great surprise of Rajapaksa himself. The Pohottuwa victory is a Mahinda Rajapaksa victory. At all election rallies, Mahinda Rajapaksa was cheered like mad when he arrived on the platform. (E.g. see Derana news 4.12.17 Podujana rally at Badulla.) It reminded me of the 1960s singer, Elvis Presley. Elvis Presley was virulently hated and deeply loved in equal proportions throughout his career. Elvis did not care, he continued singing. Pohottuwa victory has had a positive impact on Mahinda Rajapaksa. He is visibly more confident and determined. He told Indian Express It is quite clear from the massive victory of the Sri Lanka Podujana Peramuna in the recent local elections that people of Sri Lanka want to see us return to power. They want to see an end to the chaos that has reigned in this country since January 2015.” After Putin’s election in Russia Mahinda Rajapaksa was visited by the Russian ambassador to Sri Lanka. Rajapaksa had sent his best wishes to President Putin. Pohottuwa is yet a fledgling, untested political party. But it is directed by very seasoned politicians, who know the game. Therefore it will not be easy to squash it. Further, Pohottuwa is not simply an anti-Yahapalana party. It is a part of the new wakeup call in Sri Lanka. Pohottuwa may mark a new beginning in the political history of Sri Lanka provided of course Pohottuwa manages to get its act together and deliver. An analysis of the votes will probably show that Pohottuwa, unlike the SLFP, has a strong following among the urban intelligentsia. In Kandy Municipal Council, Pohottuwa came second with 23,300 while UNP got 26,798. In Colombo MC UNP got 131,353 and Pohottuwa got 60,087 of which one vote was mine! It was a good showing, I thought. Pohottuwa also won elsewhere in the Colombo district, such as Kotte MC, Kaduwela MC, and Kesbewa UC. Pohottuwa clearly has the formidable support of the Maha sangha. Rows of bhikkus were present at the launch of Pohottuwa. The Maha sangha are virulently anti-Yahapalana today. They appear on television, in groups, never singly, looking grim, fearlessly using strong words against the Yahapalana government. Critics say that sangha should not meddle in politics. These critics forget that the sangha are citizens of Sri Lanka and are entitled to all political rights enjoyed by a citizen. The resounding victory of the Sri Lanka Podujana Peramuna (SLPP) symbolized by the Pohottuwa (Lotus Bud) at the recent local government election is something that was eagerly wished for and confidently expected by the sensible majority of the Sri Lankan electorate, said Rohana Wasala.. The extremely unpopular Yahapalana government will be unable to follow its original plans through, including its controversial constitution making project. The anti-government vote means that the Yahapalana regime can no longer find refuge in the so-called popular mandate they claimed to have got in 2015 concluded Wasala. This entry was posted on Saturday, March 31st, 2018. You can follow any responses to this entry through the RSS 2.0 feed. You can skip to the end and leave a response.